In due course she gave birth to a son, the first-born to Ibrahim, and the child was named Ismail. Ibrahim was at that time 86 years old. Until Ibrahim’s return from Egypt, Lut had all along been with him. Then Lut was called to Prophethood and was directed to preach to the people inhabiting the then prosperous region lying to the southeast of the Dead Sea. The sinful people rejected his repeated appeals to reform themselves and to obey Allah. Ultimately Allah destroyed the intransigent population and their habitat, saving Lut and a few of his believing followers.7 This happened some 12 or 13 years after the birth of Isma’il. The scenes of destruction and devastation are still visible in the region. Thus the spot was settled and it soon grew to be an important trading centre, lying conveniently on the trade route from Yaman to the north and vice-versa. Isma’il grew up among the Jurhum tribe, learning the pure Arabic tongue from them. When grown up he successively married two ladies from the Jurhum tribe, the second wife being the daughter of Mudadd ibn ‘Aim, leader of the Jurhum tribe. The test was for both father and son and both had creditably passed it. It was as a reward for having passed this test that Allah further blessed Ibrahim and gave him the good tidings that He would favour him with another son by his first wife Sarah, though both he and she had grown quite old14. Thus another son, Ishaq, was born to Ibrahim by Sarah when Isma’il was about 14 years old. On another occasion when Ibrahim visited Makka Allah bade him build a house for His worship15. Accordingly, he built the Ka’ba, assisted by his son Isma’il. As they raised the foundation they prayed to Allah to accept their good deed, to render them submissive to His will, to raise from among their progeny a people submissive to Allah and to raise from among them a Prophet who would purify them and recite unto them His scripture and directives16. Further they prayed Allah to make Makka and its vicinity a land of peace and security and to feed its people abundantly – “such of them as believe in Allah and the Last Day.” (Qur’an, 2:126). When the building of the Ka’ba was completed Allah commanded Ibrahim to proclaim to mankind the duty of pilgrimage to the House (Ka’ba)17. So Ibrahim introduced the rite of pilgrimage to the Ka’ba. The Qur’an as well as the Bible state that Allah especially blessed Ibrahim and both his sons, Isma’il and Ishaq, intimating that their descendants would multiply into nations18. Indeed, it was according to the Divine plan that the two sons were settled in two different lands. Ibrahim lived long to see his sons grow into maturity, establishing their respective families. According to the Old Testament Ibrahim lived for 175 years and when he died both Isma’il and Ishaq together buried him19. Isma’il also lived long for 137 years and left behind him twelve sons from whom twelve tribes arose20. They and their descendants lived at Makka; but as their numbers increased they scattered over the other parts of Arabia. Of the tribes who arose out of the twelve sons of Ismail, those from the eldest two, Nabat and Qaydar21 became more prominent. The descendants of Nabat migrated from Makka towards the north where, in the course of time, they founded the famous Nabatian Kingdom (sixth century B.C. to 105 A.C.) with Petra as its capital. The descendants of Qaydar continued to live at Makka and its vicinity for long till the time of ‘Adnan, probably the 38th in descent from Qaydar. The descendants of ‘Adnan through his son Ma’dd and grandson Nizar multiplied so greatly that they were in the course of time divided into numerous tribes and spread over all parts of Arabia including Bahrayn and Iraq. Most of the tribes who subsequently attained prominence traced their descent from ‘Adnan and thus called themselves ‘Adnanites. Such famous tribes as Taghlib, Hanifah, Bakr ibn Wa’il, Qays ibn ‘Aylan, Sulaym, Hawazin, Ghataffan, Tamim, Hudhayl ibn Mudrikab, Asad ibn Khuzaymah, Thaqif, and Quraysh (sons of Fihr ibn Malik ibn al-Nadr ibn Kinanah) all traced their descent from ‘Adnan and through him from Isma’il and Ibrahim. Indeed, this Abrahamic tradition was the most important and universal feature in the social life of the Arabs. It was the symbol of their unity and identity, despite their division into numerous independent tribes. It found expression in their practical life in various ways. Each and every tribe meticulously maintained their genealogy tracing it ultimately to Isma’il and Ibrahim. They universally practised circumcision as an Abrahamic tradition (Sunnah). All the peoples of all the tribes believed the Ka’ba to have been built by Ibrahim and they considered it as their spiritual centre. They even placed images of Ibrahim and Isma’il along with other images, in the Ka’ba. In pursuance of the Abrahamic tradition, all the Arabs used to perform pilgrimage to the Ka’ba and Makka, to make sacrifice of animals in connection with that rite, and to circumambulate the Ka’ba. And despite their relapse into gross idolatry, they did not forget the name of Allah, Whom they regarded as the Supreme Lord — a faint remnant of monotheism which Ibrahim and Isma’il had taught. And most important of all, when the Prophet asked them, through the Qur’anic text, to revert to the true faith of their forefather Ibrahim (millata ‘abikum Ibrahim) they did not controvert him on this point of their ancestry going back to Ibrahim, although they were only too ready to oppose the Prophet on all conceivable grounds. This is worth emphasizing; for nothing was more obnoxious to an Arab than to ascribe a false or imaginary ancestry to him. Of the others who reiterated and elaborated the same views mentioned may be made of J.D. Bate and Richard Bell. The former prepared an independent monograph entitled Enquiries Into the Claims of Ishmael24 in which he set forth almost all that the orientalists have to say on the theme including the question of the sacrifice of Isma’il. The latter, Richard Bell, suggested that the relevant Qur’anic passages on the subject are “later” revisions during the Madinite period of the Prophet’s mission25. Clearly, the subject calls for separate treatment. The scope of the present work, however, necessitates confining the present section to a consideration of Muir’s views that are mainly elaborated and reiterated by his successors. He admits, however, that the Abrahamic tradition and the legend connected with the Ka’ba were widely current and accepted in Arabia and Makka before the rise of Islam28 but he holds that these traditions, though earlier than Islam, grew there much subsequently to the time of Ibrahim. Muir mentions in this connection that though “a great proportion of the tribes in northern and central Arabia were descended from Abraham, or from collateral stock, we have no materials for tracing their history from the era of that patriarch for nearly two thousand years.”29. Therefore he proceeds to “conjecture”30the “facts” as follows. He says that there were earlier settlers at Makka, many of whom were natives of Yaman. They brought with them Sabeanism, stone worship and idolatry. 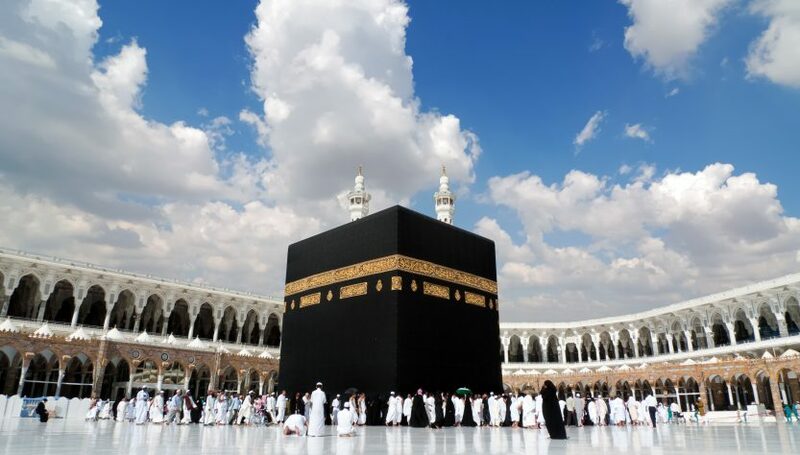 “These became connected with the well of Zamzam, the source of their prosperity; and near to it they erected their fane [the Ka’ba], with its symbolical Sabeanism and mysterious black stone. Local rites were superadded; but it was Yemen, the cradle of the Arabs, which furnished the normal elements of the system.”31 Subsequently, an Isma’ilite tribe from the north, “either Nabataean or some collateral stock”, was attracted there by its wells and favourable position for caravan trade. This tribe carried “in its train the patriarchal legend of Abrahamic origin” and engrafted “it upon the local superstitions.” “Hence arose the mongrel worship of the Ka’ba, with its Ishmaelite legends, of which Mahomet took so great advantage.”32. On the basis of such facts and arguments, Muir states that there “is no trace of anything Abrahamic in the essential elements of the superstition. To kiss the black stone, to make the circuits of the Ka’ba, and perform the other observances at Mecca, Arafat and the vale of Mina, to keep the sacred months, and to hallow the sacred territory, have no conceivable connection with Abraham, or with ideas and principles which his descendants would be likely to inherit from him”38 These were according to him “either strictly local” or being connected with the system of idolatry prevailing in the south of the peninsula, were imported to Makka by Banu Jurhum and others. Clearly, this thesis of Muir’s is based on four assumptions, namely, (a) that polytheism and polytheistic practices existed at Makka before the migration of the Isma’ilite tribe there; (b) that the Ka’ba and the rites connected with it are polytheistic and are of south Arabian origin, “having no conceivable connection with Abraham”; (c) that an immigrant Isma’ilite tribe superimposed the Abrahamic legend on those rites and (d) that the combined system was then by degrees adopted by the Arab tribes as the national religion. The facts and arguments adduced by Muir do not, however, substantiate any of the four above-mentioned elements of the theory. With regard to the first assumption, Muir mentions three facts. First, he says that the fifth century B.C. Greek historian Herodotus speaks of an Arabian goddess Alilat. Muir notes that Herodotus does not speak specifically about Makka but maintains that Alilat should be identified with the well-known Makkan (in fact Ta’ifan) goddess Al-Lat. It should be pointed out that Herodotus, in fact, speaks with reference to north Arabia. Even taking his statement to apply to Arabia in general, and accepting the identification of Alilat with Al-Lat, the evidence would take us back only to the 5th century B.C., that is, by Muir’s own admission, to a period some one thousand and five hundred years subsequent to that of Ibrahim. Muir’s second fact is that the first century B.C. Greek writer Diodorus Siculus speaks of a universally venerated Arabian “temple”. Muir rightly takes it to refer to the Ka’ba, but this evidence takes us back still less in point of time. i.e., only to the first century, B.C. Muir’s third fact is that polytheism and polytheistic shrines were widespread all over Arabia. He cites this fact on the authority of Ibn Hisham (in fact Ibn Ishaq). It should be pointed out that the latter speaks of a state of affairs that prevailed prior to the emergence of the Prophet. Neither Ibn Ishaq nor any other authority implies that the situation obtained from time immemorial.
. According to modern critics, the extant Old Testament was composed not later than the fifth century B.C. As it speaks of a state of affairs already prevailing in northern and central Arabia, which includes Makka, for a long time, and not of a recent dispersion of the Kedarite tribes over those regions, the Isma’ilite tribes must have been settled at Makka long before the fifth century B.C. In fact, none of those shrines was older than the Ka’ba, nor was any one of them regarded by the Arabs as of similar antiquity and commanding comparable veneration. This fact alone proves that those shrines were established in imitation of the Ka’ba. That they were devoted to idolatrous gods or goddesses was also naturally in imitation of the idolatry which had in the meantime been installed at the Ka’ba, not vice-versa, as Ibn Ishaq and others very distinctly mention. Idolatry had of course been prevalent in many of the surrounding countries since a much earlier period, but to prove that the Ka’ba was originally built as an idolatrous temple requires some more relevant evidence than what Muir has adduced. All that he has mentioned, to repeat, takes us back only to the fifth century B.C. He cannot imply that the Ka’ba was built so late as the 5th century B.C. or around that time. Muir admits that the Abrahamic tribes of Arabia “originally possessed knowledge of God.” They indeed did; it has been noted earlier that despite their declension into gross idolatry they had not lost sight of Allah (God) as the Supreme Lord of the universe. And it is remarkable that throughout the ages the Arabs used to call the Ka’ba the “House of Allah” or Bayt Allah. While all the other shrines were each named after some specific god or goddess, such as the shrine of Al-Lat, that of AI-‘Uzza, that of Wadd and so on, the Ka’ba was never called after any such idolatrous deity, not even after the Quraysh’s principal idol Hubal. If the Ka’ba was originally built for any idolatrous deity, the name of that deity would have remained associated with it. It cannot be supposed that the name of that deity was obliterated when the immigrant Ismailites allegedly superimposed the Abrahamic tradition upon the “temple”. If such subsequent superimposition had at all taken place, it is more in accord with reason that the name of that idolatrous deity would have been conjoined with Allah at the time of the supposed integration of the Ka’ba with the Abrahamic tradition. To prove the supposed idolatrous origin of the Ka’ba, Muir states that the “native systems of Arabia were Sabeanism, Idolatry, and Stone worship, all connected with the religion of Mecca.”43 This is a highly misleading statement. The religious systems mentioned were, of course, prevalent in Arabia at different places and at different times, not equally and everywhere at the same time. Sabeanism with its worship of the heavenly bodies prevailed in south Arabia. Muir does not show how this system was “connected with the religion at Mecca” except saying that as late as the fourth century “sacrifices were offered in Yemen to the sun, moon, and stars” and that the “seven circuits of the Kaaba were probably emblematical of the revolutions of the planetary bodies.”44 It is not understandable how sacrifices offered in Yaman “to the sun, moon and stars” could be connected with the religion at Makka. The Makkan unbelievers did, of course, offer sacrifices to their idols; but they did never do so by way of worshipping the sun, the moon, and the stars! Indeed the practice of sacrificing animals, or even human beings, for gods and goddesses, had been prevalent among many ancient peoples before even Prophet Ibrahim’s(P) intended sacrifice of his son to Allah. But none would, therefore, suggest that such sacrifices by the other ancient peoples or by Ibrahim were only symbolical of Sabeanism! In fact, the term Sabeanism is derived from the Sabaeans who emerged on the scene of history much subsequently to the generally assigned date of the Ka’ba. More specifically, worship of the heavenly bodies was prevalent among the ancient Greeks, among others. In that perspective, Sabeanism was only a south Arabian manifestation of Hellenism. More strange is Muir’s statement that the “seven circuits of the Kaaba were probably emblematical of the revolutions of the planetary bodies”. There is no indication whatsoever that the Sabaeans or other ancient worshippers of the heavenly bodies used to make seven circuits around any object as part of their astral worship. It is also quite unreasonable to suppose that the ancient Makkans or others of the time were aware of “the revolutions of the planetary bodies”. If they had such modern astronomical knowledge, they would not have worshipped the heavenly bodies at all. As shown above, the evidence adduced by Muir does in no way show that the idolatrous shrines in Arabia and the attendant worship of stones or stone images came into existence before the erection of the Ka’ba. And Muir is grossly wrong in supposing that the Black Stone at the Ka’ba was symbolical of stone worship. Whatever the origin of the Black Stone and whatever the origin of stone worship in Arabia, the pre-Islamic Arabs, neither of Makka nor of the other places, are never found to have worshipped the Black Stone of the Ka’ba. The kissing of the Black Stone was no worship of the stone itself; it marked only the start of making the circuit around the Ka’ba. This circumambulation was not done for any specific idol in the Ka’ba or around it. It was to all intents and purposes a circumambulation of the House of Allah. And it is only an instance of the peculiar coexistence of the Abrahamic traditions and idolatry which the Makkan religion represented on the eve of the rise of Islam. It should be noted here that it was very much the practice of Ibrahim(P) that in the course of his travels from one land to another he set up, wherever he halted, a stone to mark a place dedicated to the worship of Allah (“an altar unto God” as it is put in the English versions of the Old Testament)46. Neither was the Black Stone of the Ka’ba symbolical of stone worship, nor were the Prophets Ibrahim(P), Ishaq(P) and Ya’qub(P), by any stretch of the imagination, stone worshippers on account of their erection of stone pillars as “altars unto God”. The dogmatic assertion that the rites connected with the Ka’ba “have no conceivable connection with Abraham, or with the ideas and principles which his descendants would be likely to inherit from him”, is a downright misstatement. So far as the Black Stone is concerned, its connection with Ibrahim and with the ideas, practices, and principles that his descendants were likely to inherit from him, are indubitably demonstrated by the above-mentioned testimony of the Old Testament. That the institution of sacrifice also is very much in line with the Abrahamic tradition admits of no doubt, the incident of the intended sacrifice of his son being so clearly narrated in both the Old Testament and the Qur’an. In this case, too, the coexistence of Abrahamic rites with idolatrous practices is noticeable. While the unbelieving Arabs used to sacrifice animals on various idol altars at different places, their sacrificing of animals at Mina at the time of the pilgrimage was only in pursuance of the Abrahamic tradition. It was no sacrificing for any particular idols or their idols in general. Neither any idol nor any altar was there at Mina or ‘Arafat. Indeed the pilgrimage, the staying at Mina, the standing at ‘Arafat and the sacrifices made on the occasion were not done for any idol or idols. These were performed purely in accordance with the Abrahamic tradition. Muir’s remarks about sacrifice are somewhat confusing. In attempting to show the supposed connection of Sabeanism with the Makkan religion he states, as mentioned earlier, that as late as the fourth century A.C. sacrifices were offered in Yaman “to the sun, moon and the stars”. But while suggesting that the Abrahamic tradition was grafted on the supposedly preexisting Ka’ba and its rites by an ‘Isma’ilite tribe he states that “the rites of sacrifice and other ceremonies were now for the first time introduced or at any rate associated with the memory of Abraham.”49 This statement of Muir’s constitutes, in fact, a confession of the weakness of his theory and an admission that the “rites of sacrifice and other ceremonies” were very much connected with the Abrahamic tradition. The Ka’ba and its rites, of course, go back to very remote antiquity. And it is also noted that Muir makes a distinction between the prior existence of the Ka’ba and the extensive homage to it on the one hand, and the Abrahamic tradition on the other, which according to him was superimposed on it and its rites. But that does not resolve the inconsistency and difficulty involved in his proposition. If the Arab tribes had since antiquity been paying extensive homage to the Ka’ba and its rites, they would not simply add to these institutions only the name of Ibrahim at a subsequent stage -for that is in essence what Muir suggests – just because an Isma’ilite tribe came to settle at Makka and imposed Ibrahim’s name on the existing institutions. In all likelihood, such an illegitimate attempt on the part of an Isma’ilite tribe would have met with universal resistance, both from the preexisting idolatrous population of Makka as well as from the Arab tribes. Muir seems to have foreseen the difficulty. Hence he recognizes, on the one hand, the fact that the Arab tribes of northern and central Arabia were by and large of Abrahamic origin so much so that both the Jews and the Old Testament spoke of them as Kedarites (i.e., descendants of Isma’il’s son Kedar or Qaydar) and, on the other, attempts to make room for his theory in the situation by suggesting that it is “improbable” that the memory of the connection with Ibrahim “should have been handed down from the remote age of the patriarch by an independent train of evidence in any particular tribe, or association of tribes”. As noted earlier, he suggests that “it is more likely that it was borrowed from the Jews, and kept alive by occasional communication with them.”51 Now, it is highly unlikely that an acknowledged conservative people like the Semitic Arabs, who of all people were the most attached to their ancient traditions, remembering their individual genealogies going back to a distant past, would have continued to venerate the Ka’ba and its rites as belonging to their common past, and at the same time forgetting the real fact of their descent from Ibrahim. The nature of “living tradition” is not that it should have been handed down “by an independent train of evidence in any particular tribe, or association of tribes.” It is handed down from generation to generation by “popular memory”, not by the memory or evidence of any particular individual or tribe. It is also just not correct to say, as Muir does, that the Arab tribes having supposedly forgotten their descent from Ibrahim “borrowed” the memory “from the Jews” and it was “kept alive by occasional communication with them.” No people who had forgotten their common ancestor would accept the ancestor of other people as their ancestor too because the latter stated so, without further and an “independent train of evidence.” The fact is that the Arab tribes of central and northern Arabia were not merely on “occasional communication” with the Jews. Throughout the ages till almost the beginning of the Christian era the Jews and the Kedarite tribes of northern and central Arabia were on constant contact with one another and they very much constantly remembered their common descent from Ibrahim. But leaving aside all these questions and going with Muir all the way, it is only reasonable to suppose that if the Jews at any point of time reminded the Arab tribes of their descent from their common patriarch Ibrahim, they would also have been told that that patriarch was no polytheist and that the (supposedly) pre-existing Ka’ba and its rites had no connection with him. Therefore the Arab tribes would not associate the Ka’ba and its rites with the memory of Ibrahim even when they were reminded of their actual ancestor. But, since the Arab tribes, by Muir’s admission and by all the available evidence did in fact associate the Ka’ba and its rites with Ibrahim for long before the coming of Islam, a natural corollary of Muir’s suggestion is that the Jews, when reminding them of Ibrahim, must also have told them that the Ka’ba and its rites were of Abrahamic origin. The unreasonableness of Muir’s proposition does not end here. He says that the Isma’ilite tribe, when it came to settling at Makka, brought “in its train the patriarchal legend of Abrahamic origin” and engrafted “it on the local superstitions.” Thus by Muir’s own statement, when the Isma’ilite tribe came to Makka, they had not forgotten their Abrahamic origin. It is, therefore, reasonable to add that they had also not lost sight of the fact that Ibrahim was no polytheist. Hence they would not have desecrated the sacred memory of their ancestor by associating it with the (supposedly) pre-existing and polytheistic Ka’ba and its rites, the more so because these institutions had long been commanding the homage of the Arabs. In such a state, if they intended to integrate themselves with the Arab tribes, or vice versa, they would have simply allowed the Abrahamic memory to remain in the background and would have accepted the Ka’ba and its rites as they were; for by so doing they would not have lost anything, neither their domicile nor the profitable trade of Makka. Since they did not do so, but accepted, as it is said, the Ka’ba and its rites as of Abrahamic origin, notwithstanding their having retained the memory of their descent from Ibrahim, and since also the Arab tribes accepted the Ka’ba and its rites as of Abrahamic origin, notwithstanding their constant touch with the collateral branch of Ibrahim’s descendants, the Jews, the natural conclusion is that they did so because they knew that the Ka’ba and its rites were of Abrahamic origin. Thus a rational analysis of even Muir’s theory of subsequent migration to and settlement at Makka by an Isma’ilite tribe, together with the other assumptions he makes and the facts he admits, leads to the unavoidable conclusion that the Ka’ba and its rites were of Abrahamic origin. Muir’s above-discussed theory and assumptions proceed from his understanding of the information contained in Gen. 21:21. He says: “Hagar, when cast forth by Abraham, dwelt with her son in the wilderness of Paran, to the north of Arabia.”52 The above-mentioned passage of the Genesis simply says that Ismail and his mother “dwelt in the wilderness of Paran”. The clause, “to the north of Arabia”, is Muir’s own statement based understandably on the identification of Paran made by other Christian writers and exegetes of the Bible. Paran is mentioned in connection with other events at three other places in the Old Testament.53 But in none of all these places it is clear what exactly is the locality meant by the name Paran. The answer to the question where, according to Genesis 21:21, Hajar and Isma’il settled thus depends on the correct identification of Paran. Thirdly, a close look at Gen. 21:14-15 would make it clear that the two consecutive passages do not really speak of one and the same occasion. The statement in Gen. 21:14 that Hajar “wandered in the wilderness of Beersheba” does not mean that she wandered only there and proceeded no farther. Nor does the statement in Gen. 21:15, “And the water was spent in the bottle, and she cast the child under one of the shrubs”, mean that the incident took place in or in the vicinity of Beer-Sheba. Nor does it mean that the same water in the bottle with which she had left her home “was spent” and therefore she was obliged to “cast the child under one of the shrubs”. Beersheba was a place well known to her, Ibrahim having lived there with her for long. There were also a number of wells scattered over the region and dug by different persons, as the Old Testament very clearly states at a number of places. The well at Beer-Sheba itself was dug by Ibrahim. All these could not have been unknown to Hajar. She could, therefore, have obtained further water, after a little search, from any of the many wells in the area. In fact, the Old Testament writer here describes, in two very short and consecutive passages, the long and arduous wanderings made by Hajar, of which the beginning was her wanderings in Beer-Sheba and the last stage was at such a place where she could get no water, nor replenish her bottle in any way. So in utter distress and despair, she cast the child under one of the shrubs. The two passages speak of two different stages of her wanderings, separated by not too small gaps of time and place. Thus it is very clear from the Genesis that it was not really because of Sarah’s desire but decisively because of God’s plan and assurance of a fruitful future for Isma’il communicated to Ibrahim, and His command to him, that he banished Hajar and Ismail to a different land. God’s words to Ibrahim, “for in Isaac shall thy seed be called”, was a consolation as well as an assurance that the banishment of Ismail did not mean an end to or a constriction of the line of Ibrahim’s descendants. The statement, “in Isaac shall thy seed be called” meant that Ibrahim’s progeny will continue there where he was at that time, through Ishaq; whereas the other statement was an emphasis on the fact that Isma’il was his seed (“he is thy seed”) but his progeny will be multiplied and made into a nation in another region. By the very nature of this plan of God’s (and Sarah’s desire to exclude Isma’il from his father’s immediate possessions was itself part of God’s plan), Hajar and Ismail could not have been settled in any place in the region of Beer-Sheba and Sinai, which were very much then within the sphere of Ibrahim’s and Sarah’s activities. Hajar and Isma’il could only have been and were indeed consigned to a far-away and unsettled land. The Paran/Faran mentioned in the Genesis as their domicile could not simply have been any Paran in and around Beer-Sheba and Sinai, as the Christian scholars imagine. Thus, despite some obvious discrepancies in the description of the Genesis, it is in consonance with all the essential features in the Qur’anic and Islamic accounts; and they combined to prove that Hajar and Isma’il were settled at Makka, according to the Divine plan and provision.